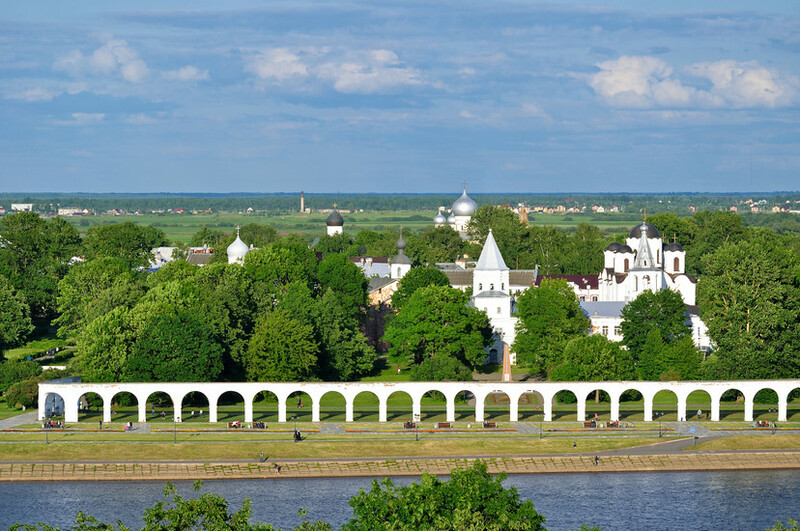 Around 180 kilometers south of St. Petersburg we can find Veliky Novgorod, the oldest city in Russia, whose historical center is declared as a World Heritage Site by UNESCO and it’s quite worth a visit. I’ll explain you how to get there and what to see. 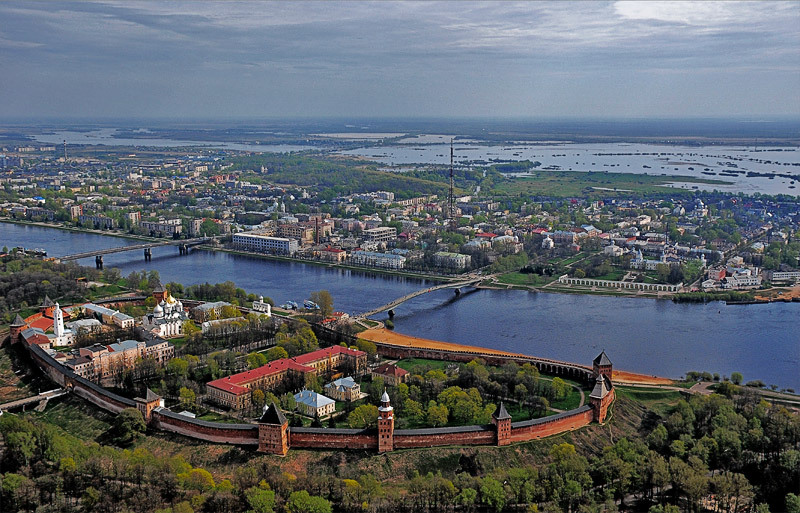 Veliky Novgorod is a beautiful city of about 230,000 inhabitants, located about 180 kilometers south of St. Petersburg, known as “The Birthplace of Russia” or “The Oldest City of Russia”, as it was in this city, in 862, where Prince Rurik proclaimed the modern Russian state. Until the year 1478, the city was called Gospodin Veliky Novgorod (‘Lord Novgorod the Great’), and till 1999 its official name was Novgorod, an abbreviated name by which this city is usually known (not to be confused with Nizhny Novgorod). It was one of the most important cities of Eastern Europe during the Middle Ages and was the only principality that was saved from Mongolian dominion after the Mongolian invasion of Russia. 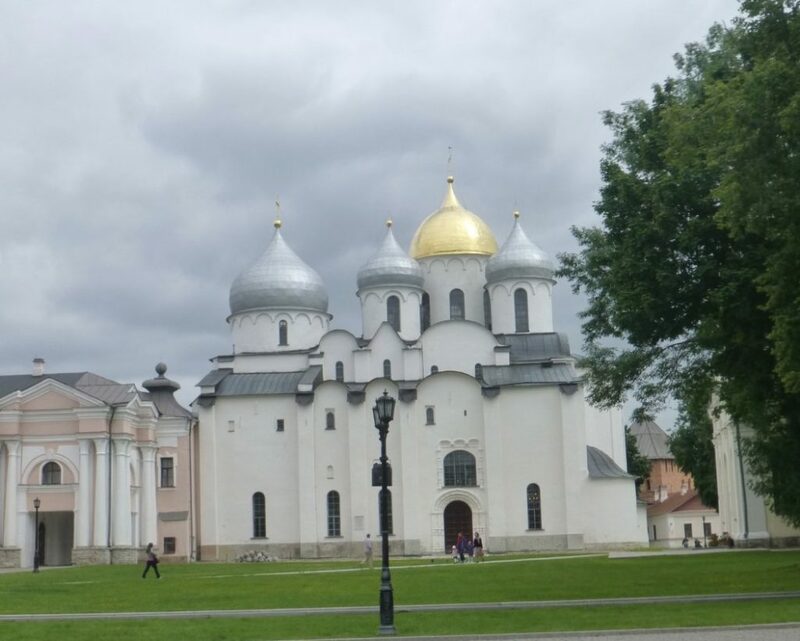 In this city, located on the banks of the Voljov River, we can find the Cathedral of Saint Sophia, built between 1045 and 1052, and it is considered the oldest city in Russia. It is part of the historical center of the city, it was declared a World Heritage Site by UNESCO in 1992, and it is located inside the Kremlin of the city. This city is also the birthplace of famous composer Sergei Rachmaninoff. Novgorod is a very popular weekend destination for St. Petersburg residents and is also very popular with tourists visiting the cities of Moscow and St. Petersburg, who also are taking advantage of the route between the two to make a stop in this ancient city. The city is located at around 180 kilometers southeast of St. Petersburg and about 524 kilometers northwest of Moscow. You can get there by train, bus or car. The easiest and quickest way is by train: from Saint Petersburg to Veliky Novgorod it takes around 3 hours and from Moscow the journey is about 5 hours. From the Novgorod railway station you can reach the city center by walking in about 10 minutes. From St. Petersburg: two fast trains depart daily (Lastochka), the first train leaves at 7 in the morning and arrives at around 10 at Veliky Novgorod, while the second leaves at about 19:30 and arrives around at 23:00 hours. 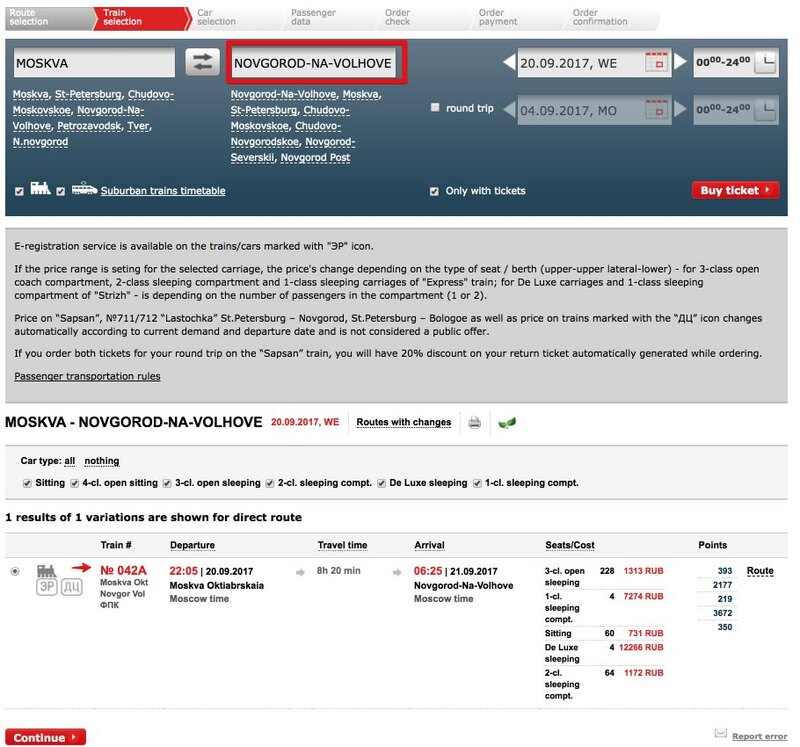 Trains depart from St. Petersburg-Glavny Station (commonly known as Moskovsky Station) and arrive at the Novgorod railway station, which is on the RZD website as NOVGOROD-NA-VOLHOVE. For the return journey there is also an early morning train and another in the afternoon. These tickets can be purchased on the RZD website. 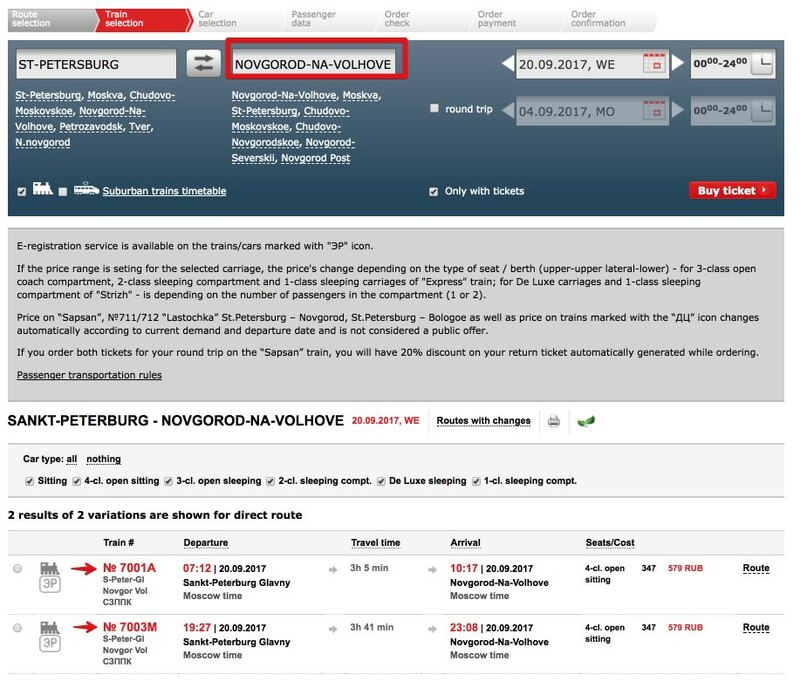 From Moscow: the most comfortable way is to take the night train that departs from Leningradsky station at 22:05 hours, and arrives at 6:25 hours in Novgorod (the ticket can be bought in advance on RZD website). 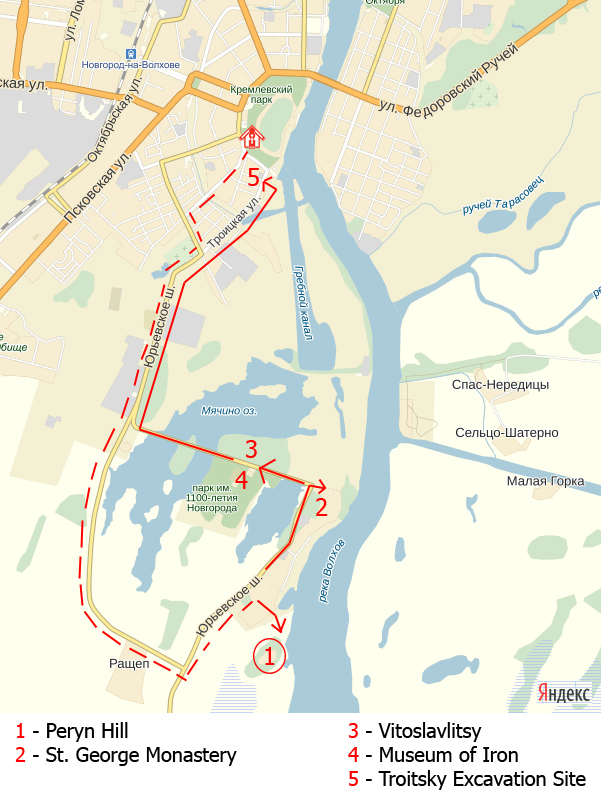 The other option is to take the Sapsan high-speed train to Chudovo (it takes around 3 and a half hours) and from there, take a bus to Novgorod (which can take 1 hour and a half). Important: these schedules may vary, so it is best to consult them directly on RZD’s website. You can find more information on how to buy tickets in this article: Trains in Russia: How to buy tickets on-line without the middle-man. 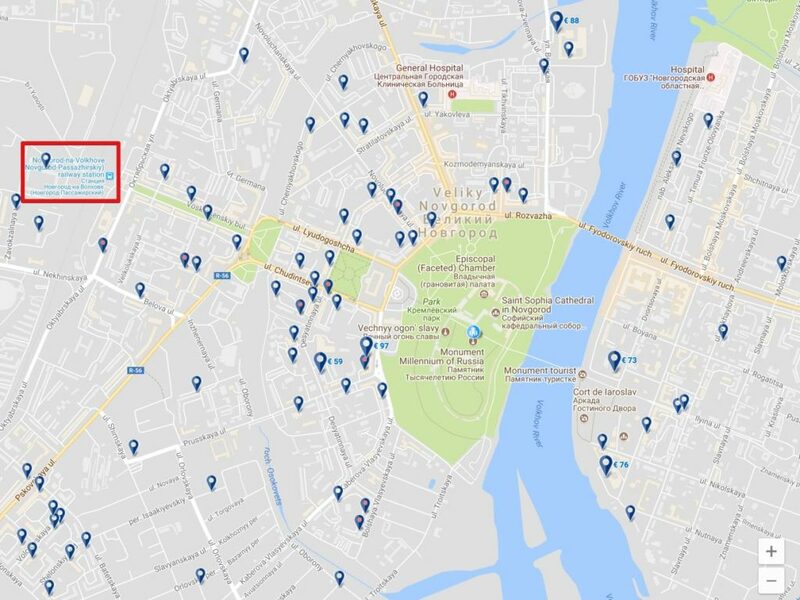 You can go and return the same day from St. Petersburg. This option can be a bit extenuating, since the journey involves more than 6 hours in train if you do a round trip. There are also organized bus tours to visit Novgorod from St. Petersburg, but the journey is about 4 hours (one way). Stop at Veliky Novgorod on the way from St. Petersburg to Moscow. If you are visiting St. Petersburg and Moscow, you can take the morning train from St. Petersburg, visit Veliky Novgorod all day, and then take the night train from Novgorod to Moscow. You can also do the reverse: take the night train from Moscow to Veliky Novgorod, visit the city by day and in the afternoon take the Lastochka train from Novgorod to St. Petersburg. To book accommodation I recommend two platforms: Booking (where it is highly recommended to read the reviews of other travelers to choose a good accommodation) or the Russian platform Ostrovok (where you can often find better prices than Booking). With regards to food, there are also many Russian food restaurants. 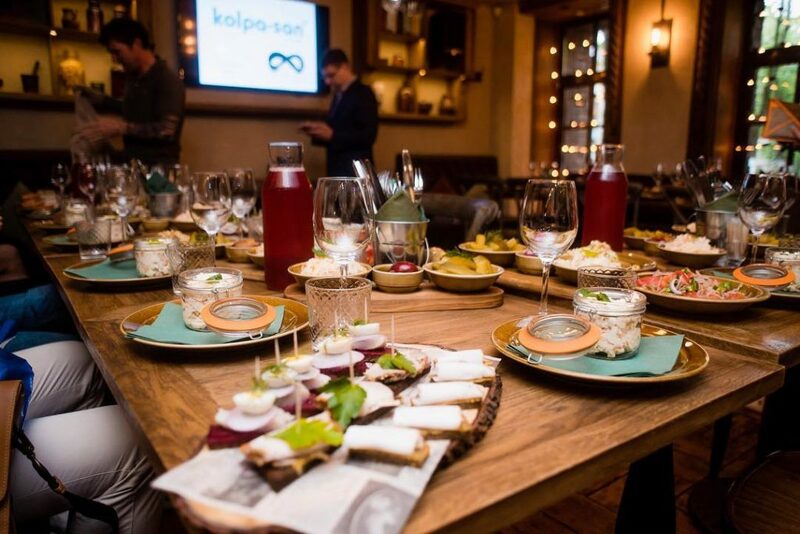 At around 10 minutes from the Kremlin (towards the train station), on Germana street number 2, we can find the Zavodbar Russian food restaurant (see photo below). Other Russian food options are the Malinovka restaurant (right next to Zavodbar) or the Sudarushka restaurant (Bolshaya Moskovskaya, 32). 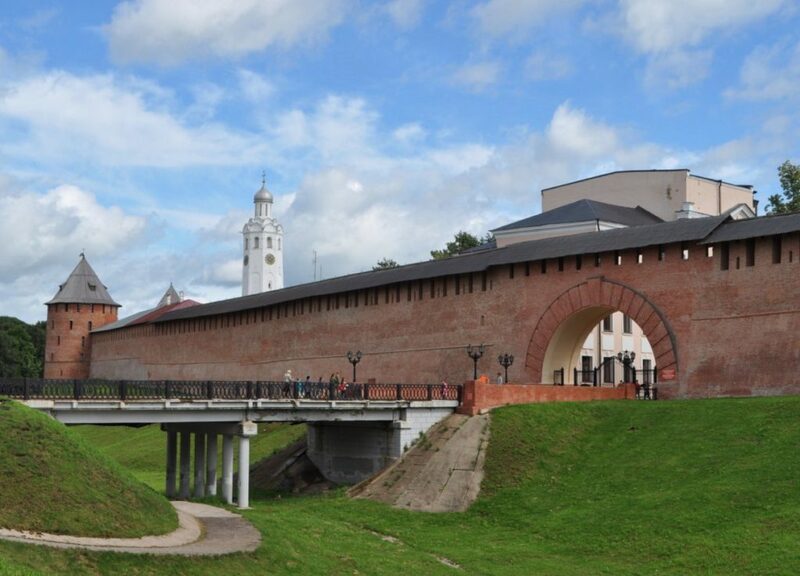 The Novgorod Kremlin is the first must see place. Formerly known as Detinets, it is the oldest surviving Kremlin in Russia. It was founded by Prince Yaroslav, being the administrative, social and religious center of Novgorod. The entrance to the Kremlin is free. It’s open from 6 in the morning until 12 at night, however, you have to pay an extra fee to visit some of the buildings inside the Kremlin. The highest tower in the Kremlin is the Kokui tower, built in the 18th century, as it offers wonderful views of the city and its surroundings. The entrance to the tower costs 200 rubles (it is closed on Mondays, Thursdays and the last Wednesday of each month, it is also closed from November to May). 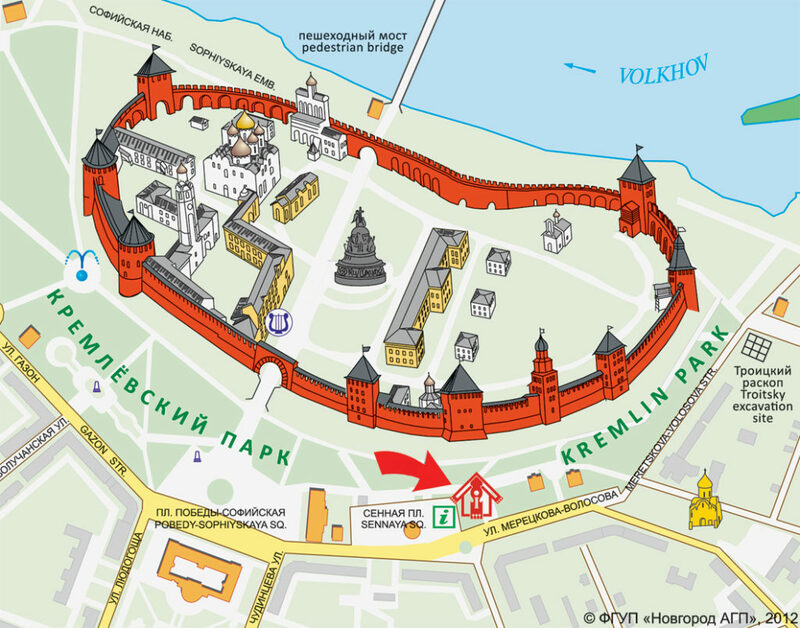 Inside the Kremlin we can find the Cathedral of Saint Sophia, the oldest in Russia, founded by Prince Yaroslav. The entrance is free, but to visit the bell tower of the Cathedral you have to pay a small extra entrance fee. In the interior of the Kremlin, it is also worth mentioning the Chamber of Archbishops, the only civilian German Gothic building in Russia, where major events such as the reception of ambassadors or the meetings of the Novgorod Parliament took place (the entrance fee costs 200 rubles). 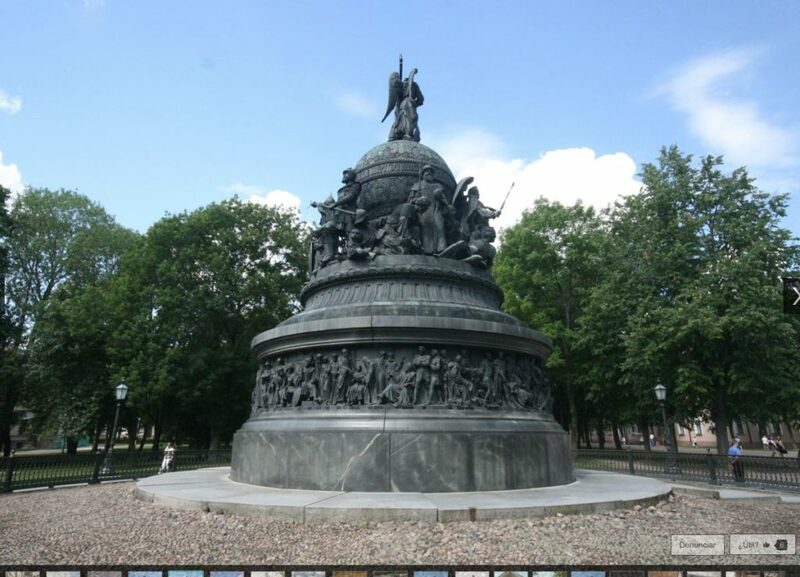 You will also find the Russian Millennium Monument, which was built in 1862 to commemorate the 1000th anniversary of Russia (free) and the state museum of Novgorod, which houses a collection of icons and other memento that is related to the city’s history (200 rubles). 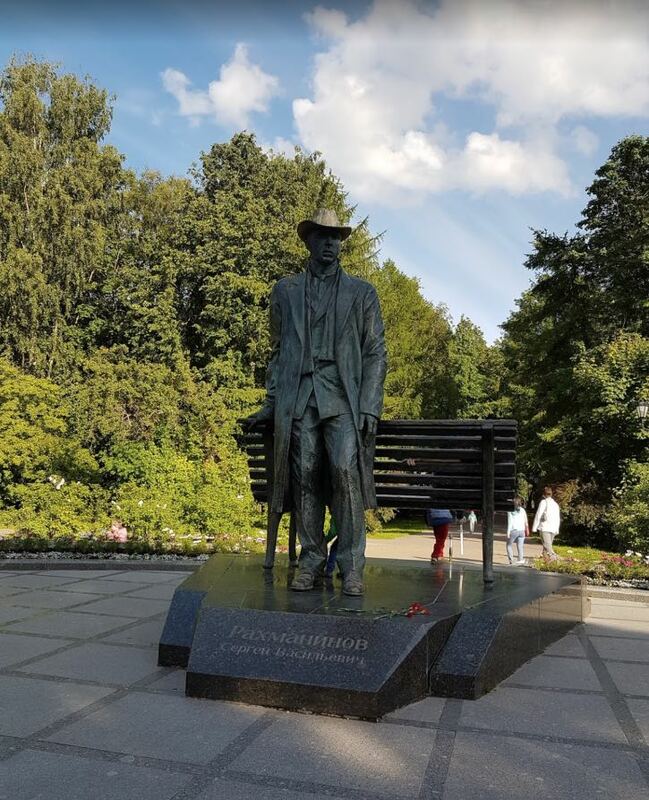 In the outer gardens of the kremlin walls you can also visit the monument dedicated to the famous composer, Sergei Rachmaninoff, who was born in this city. Leaving the Kremlin and crossing the bridge over the Vjojov river, you will arrive at the Court of Yaroslav, a garden in which the Old Market (in the arcades) was found and which is composed by several small churches, among which we can find the Cathedral of St. Nicholas, the Church of Paraskeva or the Church of St. George. Routes 1 and 2 can be done in 1 day or even less. If you have more time, it is worth visiting the monasteries of Perynsky and St. George, at the birth of the Vjojov river (near Ilmen lake). Entrance to these monasteries is free. 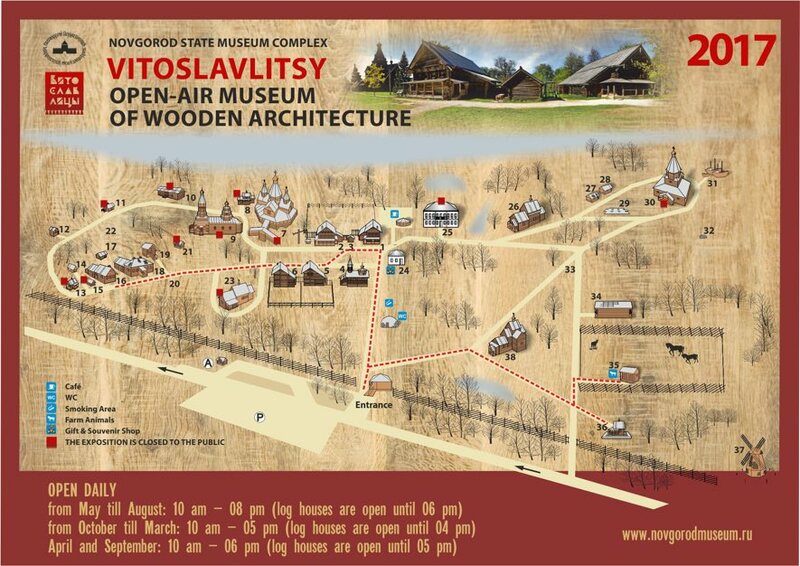 Also worth visiting is the Vitoslavlitsy Wooden Architecture Museum, located in a beautiful enclave, bathed by the waters of Miachino Lake and the Voljov River, near the Monastery of St. George. The entrance fee costs 200 rubles. 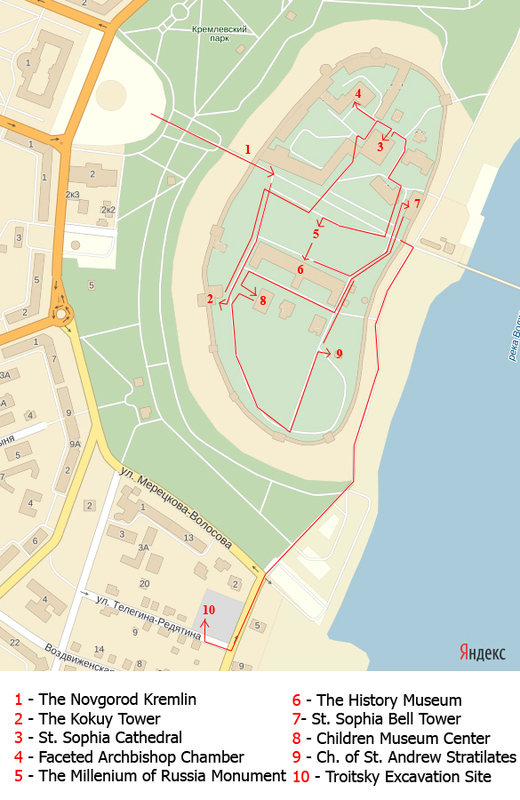 To get here you have to take the bus (numbers 7 and 7A) from Novgorod railway station. Finally, if you want to take a guided tour of this beautiful city, there are several companies that offer them. You can check them through the GetYouGuide platform. 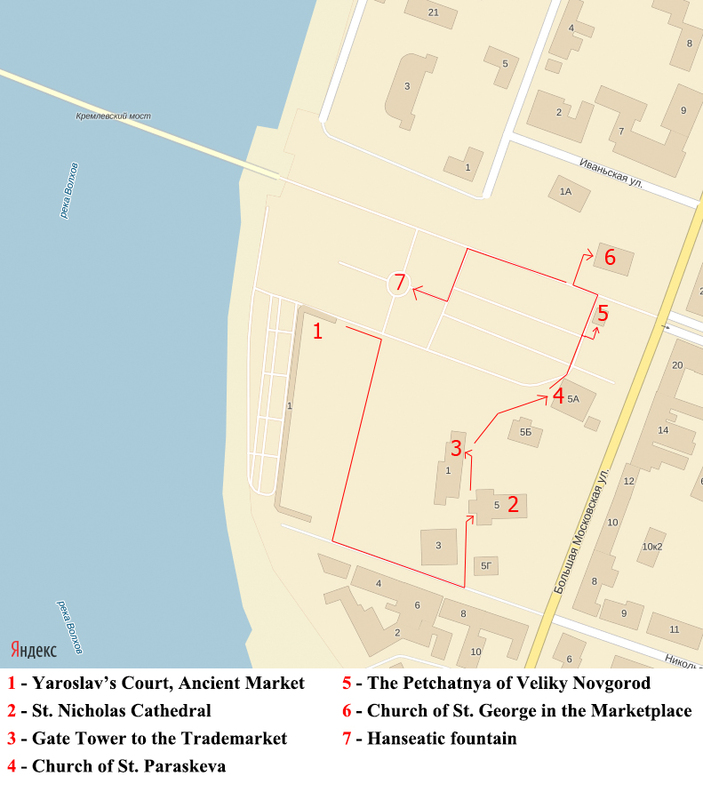 Simply enter “Veliky Novgorod” in the search box to discover the different tours that are available. Have you visited this ancient Russian city? What has been your experience? You can leave your comments below.